For their third year running, Elements will take place on August 22nd at a secret Brooklyn waterfront location to be announced later this month. For Elements, BangOn! is hosting a day long event on the waterfront from 12pm-11pm that will feature four unique stages that are a combination of live performances and DJs- Water (Deep House, Techno), Earth (Bass/Trap), Air (House), Fire (local heroes). 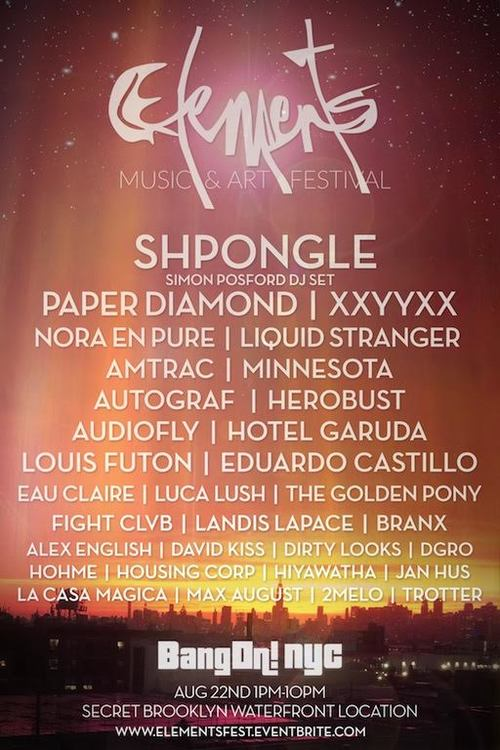 Additional talent includes Shpongle, Paper Diamond, Anna Lunoe, XXYYXX, Amtrac, Nora en Pure, and more. The producers of BangOn!’s are the leaders of independent EDM events in New York City. Trippy art installations, carnival rides, and aerial dancers, are just some of the perks from BangOn! events. The producers always recruit some of the most creative minds of our generation to illuminate their events including award-winning 3D projection mappers Light Harvest, Reality Engine, and Rhizome. The event is a routine sell-out and will play host to anywhere from 6,000-10,000 attendees. Tags: Art Festival, BangOn, Brooklyn, Elements, Music Festival, party, Shpongle. Bookmark the permalink.